Using appliqué, embroidery, and freehand quilting, Anna Torma plunges into a storehouse of accumulated experience, charting the conversion of attention into memory and meaning-making. Her results are opaque and chaotic: Fragmented animals, isolated words, and anonymous human figures all vie for attention on crowded picture planes. 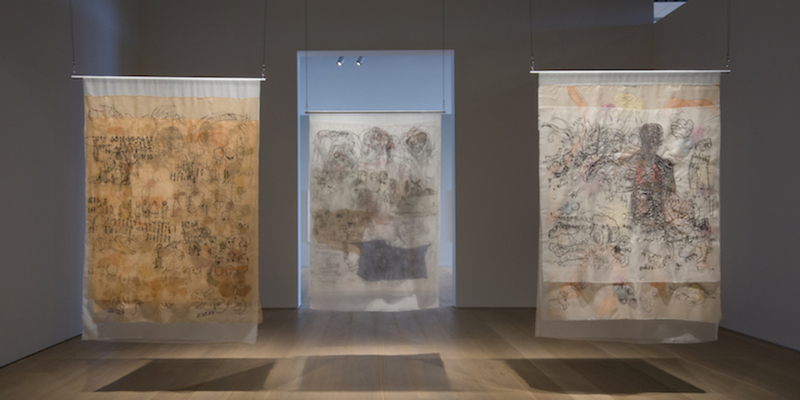 These fiber works, ranging from diaphanous silk organza to comforter-thick quilts, are primarily exhibited framed or draped against the wall. But, crucially, curator Shauna Thompson introduces Torma’s work with a trio of pieces hung from the ceiling, including the prelapsarian dreamscape Permanent Danger, 2017. Presenting textiles in this way reveals the movement of the needle through the backing, a reminder that every piece on view contains a world of half-seen, burrowing lines. Leaving both recto and verso visible also demonstrates the labor intensity of Torma’s needlework and emphasizes every thread’s simultaneous presence on two surfaces. Lines wind through the backing, curl and loop, meander in and out of sight. Often, the information in these objects spills onto itself in an incomprehensible muddle. In her most recent series, “Abandoned Details I-VII,” 2018, Torma tidies the mess into neat rows, but that spatial organization does little to clarify the whole. In Red Fragments, 2017, the artist collaborated with her late mother-in-law on a series of decomposing motifs made with traditional Hungarian cross-stitching. A needle has been left behind midstitch, a blunt emblem of incompletion necessitating an acceptance of what remains. As always.